Crochet is a very old craftsmanship, that exist since the old ones and exists very strong until today no more only for ladies but for all the ages. It has been mordenized every day and is well known as a hobby with many benefits. One of its benefits is the improvement of motor coordination, improving the concentration and functioning of the brain and also being a great antidepressant, that is, only good things and can not stop loving, as it is very gratifying and rewarding to do something with one's own hands . It is also a type of handicraft that can be manufactured numerous pieces to sell. It is important to always be practicing so that you can raise your level and be able to make new patterns. But you will only get skills and learn correctly to do the points and techniques if you always do new things and be practicing. Here on our site you always get the news, new patterns tips to start new projects. There are several beautiful patterns that can be made by crochet beginners, as I have already left here before a baby blanket pattern, if not seen then just click and look. Floral Afghans are very charming and bring the beauty of nature into your home, for that is the meaning of the flower, meaning beauty. So today I bring you a pattern of Afghan floral pattern to make your bedroom or other environment more beautiful or you can give someone you love to brighten up someone's home and nothing better and better than to do it for yourself. 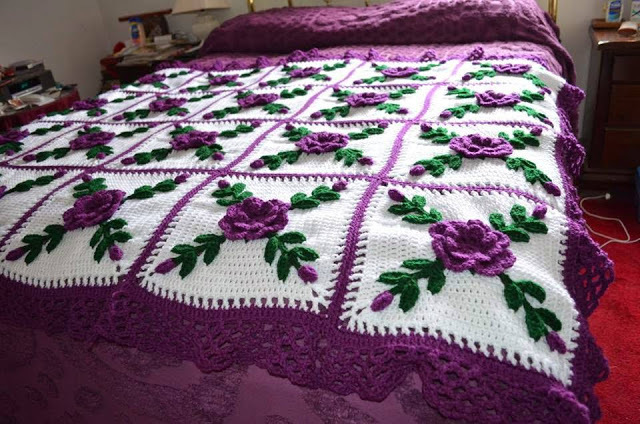 In this Bouquets Afghan bedspread model you can also mix the types of flower you want to use making the piece more unique yet, this is the good of the handicraft that has a pattern but we can change as you want and prefer. Making a wider barred gains much prominence. The result of this pattern is super harmonious and elegant, because the style of the dots combine. It can be a beautiful quilt or inspiration for baby blanket. In this pattern the points continue twisting along the piece and the bar is made in secret point. This mixture of two different points values ​​the piece and gives an even more beautiful style for your work. In addition, the choice of the line is also very important, and in the case of baby blankets mainly, the line should be softer not to hurt and also leave the mantle with more volume. If you need to insert a little color into your life, why not create a crochet bouquet that will always give you joy and satisfaction. You can focus on working on this crochet pattern while dreaming of a more pleasant mood! 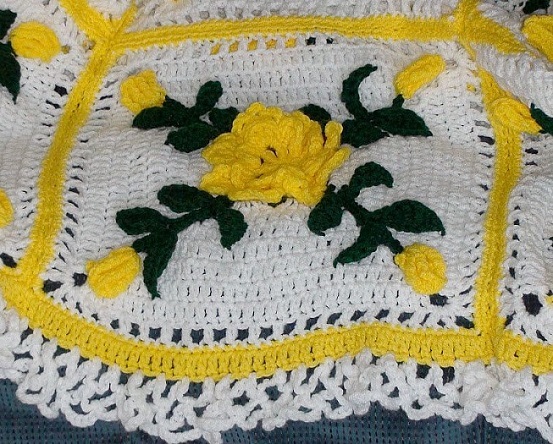 The Afghan crochet flowers are adorable and charming, as well as warm us in the cold. So use your creativity in this blanket and do it right now. Below I leave that wonder pattern, whether you want to make just a flower or a floral blanket. Do not forget to follow us on facebook, enjoy our Xell Crafts page, we are always sharing incredible standards of all levels, from beginner to advanced patterns, do not miss it. Good job.